Abstract. The purpose of the article is an analysis of the training of the experts for the exchanging market in Ukraine and the development of the recommendations to improve it. The need for the professional training of the employees for the exchanging market is conditioned by the value, which this market has in the national economy. The review of the infrastructure of the exchanging market shows that it includes a whole range of the economic and regulatory entities. This creates a strong demand for the stock exchange experts, who in addition to knowledge within their field have the skills of work on the exchanging market in general and in their special segment in particular. The system of training of the experts shall be formed accordingly. The review of the regulatory framework of the training of the exchange market experts in Ukraine indicates that the same steps that have been made earlier, did not create a unified system of training. As the leaders and teachers thinking long-term are aware of the importance of stock exchange activity, there are subjects directly or indirectly related to the exchange activities in many schools. According to the new list of specialties, specialty «Stock Exchange Activity» was transformed into «Business, Trade and Stock Exchange Activity» that would expand the scope of its use. The experience of the experts training for exchanging market overseas can be useful. Almost all state universities have the certified master programs for experts training for the exchanging market. An important component is retraining and professional development. The Ukrainian government has done very little for this, and some success has been achieved through the actions of the participants of the exchanging market themselves. To improve the situation, it is offered to include expertise in the field of stock exchange activity into the educational and job description of the expert of the specialty «Business, Trade and Stock Exchange Activity». Self-regulatory organizations should intensify their activities towards cooperation with the educational institutions. It is necessary to include points concerning training and retraining of the exchanging market experts into the regulations aimed at the development of the exchanging market. Keywords: exchanging market, stock exchange activity, students training, specialties. Any activity effectiveness is largely determined by the professionalism of its performers. This fully applies to the activities associated with the stock market functioning as a whole; and of its separate segments like equity, commodity, and currency. Given the importance of the stock market for the state economies, which have the status of market ones, it is obviously to shift the stock market importance to the questions of its staffing. This situation is common in all developed countries, however, as it is known; Ukraine is not included to this list. This is one of the reasons why in the field of training professionals for the exchange market we are considerably behind. It does not allow us to achieve the desired results in the state economy sector and, consequently, leads to a significant loss of benefits. Thus, wishing to improve the efficiency of the stock market, do not underestimate the problem of specialists training which determines the relevance of our researching. Analysis of the recent research and publications. The exchange market formation and functioning is the subject of many scientific and practical developments and research. Since the conception of exchange activities in independent Ukraine, both academics and practitioners began to develop a significant backlog of proposals and recommendations for further exchange market development in Ukraine. However, the specialists training and retraining in this area did not receive sufficient attention. At least, it was not observed at the level of state institutions, and all that was done was the initiative of individual lectors, who understood the essence of the problem, or just actively worked towards the development of their assigned disciplines. About methodological training aspects from the professional approaches standpoint to teaching in the exchange activities field, such researches are virtually absent. The vast majority of publications teaching areas relate solely to the general implementation of teaching activities. They do not focusing on the specifics of training in a particular area. These pedagogical practices which are industry direction are, as a rule, do not have narrow specialization and relate to training in general or other profiles like humanities, engineering, management, etc. However, in 2013 a teacher of language arts from The Kyiv College of Trade and Economics of Kyiv National University of Trade and Economics Gordienko V. P., defended her PhD thesis on ‘Professional speech training of future junior specialists in the exchange activities’. The thesis and the list of author’s publications considered the problems of specialist preparation on the exchange activities, not so much professional, how it is connected to the linguistic aspects. Besides, as you can see from the title of the researching, the thesis mostly confined to the level of junior specialists [1; 2]. That is why, this publication is not a continuation of the domestic scientists and practitioners’ researching about the exchange market. First of all, we have the task to light staffing prerequisites of the exchange market and trends of its development. Accordingly, the goal of the article is the analysis of the situation with the training of specialists for stock market in Ukraine and development of recommendations for its improvement. The object of research is the process of training specialists for the Ukrainian stock market. The subject of research is the methods and the approaches to such training, and their support tools. As it was mentioned in the introductory part of the article, we need to develop professional training for stock market due to the its importance to the state's economy. And if in Ukraine, in some situations it is necessary to argue, in all developed countries, such situation is the norm for quite a long time, and the exchange became an integral part of the economy over 500 years ago. In this publication we will not list all those functions that successfully performs exchange market is in most works on the stock theme, we note only that in other countries the exchange market is the basic of the state economic system and it is not an exaggeration. Therefore, in our further presentation we will assume that the importance of exchange activities as a separate type of economic activity does not require proof. As for Ukraine, unfortunately, despite considerable efforts towards the development of domestic stock market, the situation is still far from satisfactory. Moreover, if on the stock exchange market we can speak of certain successes, exchange commodity market needs a serious makeover. Despite this, no matter how developed the domestic stock market, given the processes of globalization and integration, which Ukraine is trying to take quite actively, economy of Ukraine, is still closely connected with the state of the world's stock markets. The most financial value is commodities, a significant part of the instruments to protect against adverse market situation are exchange-traded instruments, etc. So, a developed stock market will be in Ukraine or not will influence only what we get significant profits or not. But it will not influence for our independence from world markets. Accordingly, even in the hypothetical complete absence of exchange trading in Ukraine, the presence of specialists who could analyze the signals global stock markets and transform them into clear recommendations for the domestic national economy is not a subject of discussion. Despite the fact that the concept of exchange market emerged from the stock exchange institute, however, if to speak about stock market specialists training, it must go far beyond the exchange itself. Even a superficial examination of the infrastructure of the stock market shows that it includes a number of economic and governing entities which may be quite remote from the actual trading. We do not aim to enumerate them all, because these issues are well covered in the academic literature. We note that except the exchanges is brokerages, dealing centres, investment companies and funds, company assets management, clearing and depositorial institutions, enterprises and organizations which carry out trade in goods through the exchange, as well as those which is composed of the division for work with securities . We can also add banking institutions that cater to participants of the stock market; insurance company insuring the risks of futures transactions; private pension funds through the stock market ensure the preservation and enhancement of the entrusted means. Mentioned regulatory influence of the exchange market is carried out by state and public bodies of regulation and control . On the state stock market can work other formation and education, performing certain public tasks (e.g. Agrarian Fund). Thus, the list of direct or indirect participants of the exchange market is very large and can pervade the economic system of the state in all directions, both horizontally and vertically. There is no doubt that each individual group of participants has its own peculiar set of features that requires specific knowledge and competencies. This creates an extremely powerful demand for professionals exchange activities, in addition to knowledge within their field, and will have the skills to work in the stock market in General and in its specific segment in particular. If we add to this the fact that in developed countries participants of the exchange market, except legal persons is a significant part of the population, which traditionally gives preference to investing in the stock exchanges before Bank deposits [3, p. 263], the distribution of knowledge at work in the stock market increased significantly. The foregoing gives grounds to speak about the importance of training in exchange activities, and not so much on the part of exchange market participants as from the viewpoint of the state, the interest of which in the active development of this sector of the economy is beyond doubt. Accordingly, it should be formed and the system of training of specialists, which according to the classic rules of this training cannot be a point or situational, and you must have a fundamental character and to provide training at all levels. As for the bottom level of training, it is worth mentioning that the first issue of training in exchange activities at the state level was raised in 1994 when the Ukraine Cabinet of Ministers adopted Resolution № 325 from 18.05.1994. About the list of training specialties of different qualifying levels and working professionals in higher education for professional purposes. The resolution included a number of innovations, both organizational and substantive nature. In particular, they introduced the classification of educational or qualification levels, disciplines, professional fields and specialties. Under this was introduced a branch of knowledge 05 – “Economics, Commerce and business”, which under the professional direction 6.0501 ‘Economics’ first became a Junior specialist specialty 5.05010802 “Exchange activity”. Despite the fact the specialty was new, colleges and technical schools, which became the main link of training of young specialists, opened it quite willingly. Without having sufficient objective information amount about the level of preparation of graduates on the basis of a subjects list that are taught in training and could draw conclusions about their professional direction. Undoubtedly they all had a discipline of “Exchange activity” or “Stock exchanges”. However, this unified vision of the future specialists of different, including in various sectors, educational institutions and ends. So, for many exchange activity was presented as the provision of intermediary services of different nature. There were those who built the curriculum on the basis of training in the trade. Someone had fed the curriculum by subjects that later formed the basis of the evaluation. For someone exchange activity associated with any commercial activities, although in parallel with the 5.05010802 specialty “Exchange activities” was introduced and 5.05010802 specialty “Commercial activity”. Since these two professions on the level of a specialist formed the specialty 7.050108 – “Marketing”, and the training of junior specialists, marketers were not foreseen. For some schools it was a signal that the specialty “Exchange activities” provides for the preparation of specialists in marketing. Thus, training of specialists on the exchange activities of that period was hardly systematic. Although, there are no doubts the introduction was extremely positive step towards new areas of economic activities – exchange experts at the required level. However, as can be seen from the analyzed regulations, on the level of specialist training of specialists in the stock market and ended. It was not about training at the highest levels. The situation has improved after the following regulatory document adoption – Regulations of the Cabinet of Ministers dated 24.05.1997 No. 507. About the list of directions and specialties, which are trained in higher educational institutions for corresponding qualification levels. It has made some changes to the structure of the list and its contents. Thus, knowledge of the industry was renamed into “Economics, Commerce and entrepreneurship”, professional direction “Economics” study field “Economics and entrepreneurship”. With regard to the specialty junior specialist ‘Exchange activity”, it changed the cipher on 5.050112, and was removed from under the direct subordination of the specialty “Marketing”. The improvement essence in the organization of young specialists training for the specialty “Exchange activities” was the fact that for all specialties of junior specialists training direction 0501 “Economics and entrepreneurship” like the relevant scientific and methodological Commission of the Ministry of Education and Science of Ukraine approved branch standards of higher education . So, educational qualification characteristics of a graduate of a higher educational institution clearly defines the educational and training objectives, content of education, the place of the specialist in agriculture of the state, the requirements for its competence and other socially significant properties and qualities. The standard has become mandatory for education authorities, higher education institutions, as well as ministries, departments, associations, enterprises, organizations of different ownership forms, where prepared or used by the specialists of educational-qualification level ‘Junior specialist’ specialty “Exchange activities”. Thus, it created a single information base and created an integrated vision for training within the state. However, under the variable components of standard educational institutions we could introduce those features of the preparation that, in our opinion, have improved its quality and congruent with their vision of the future professional qualification. In particular, the specialization was introduced by specializations, for example, ‘Valuation of integral property, real estate transactions’. Such things are not formally contrary to the industry standard, although you can rate them definitely not very simple, because the same property or real estate is not a commodity. However, the general preparation direction was kept. It was another positive step. But again there was not professional preparation for bachelors, specialists and masters in exchange activities. The next step in the exchange activities training development (if we can call it development) was the Resolution of the Cabinet of Ministers of Ukraine dated 20.06.2007 № 839. About approval of the list of specialties, which trains professionals in higher education on educational-qualification level of junior specialist. According to the specialty decree, “Exchange activities” has been removed from the list, and instead was added to the specialty ‘Marketing activities’ and ‘Evaluation activity’. Also, for unknown reasons, despite the existence of the specialty “Commercial activity” there was added specialty “Merchandising and Commercial activity”. It was clearly indicates the lack of balanced approaches to the formation of the list of specialties. Thus, at this stage of reforming the higher education system in Ukraine the state refused of training in exchange activities even at the primary level. This situation indicates a lack of understanding by officials from higher education to economic problems and the weak position of themselves and stockbrokers, who were unable to defend the interests of the exchange sphere. A significant shift of the situation was the following resolution of the Cabinet of Ministers of Ukraine dated 27.08.2010, № 787. About approval of the list of specialties, which trains professionals in higher education on educational-qualification levels of specialist and master. Despite the fact that in the field of knowledge 0305 “Economics and entrepreneurship” on exchange activities ware not discussed, the part of this gap could close the specialty “Merchandising and Commercial activity” and “Organization of wholesale and retail trade”. However, the main achievement was in the field of knowledge 1801 “Specific categories” which appears 8.18010009 master’s specialty “Exchange activities”. In the notes to the specialization indicated that it can do the bachelors and specialists in virtually any field of studies, which significantly increased the capabilities of the specialty, based on the fact that it has no “own” baccalaureate. To use this resolution in the educational process will return later, and now, to complete the analysis of normative-legal support of the educational training component of the stock market, we want to remember another regulatory act. We are talking about the Resolution of the Cabinet of Ministers on 29.04.2015 № 266 . About approval of the disciplines and specialties list which prepares applicants for higher education. According to the decree introduced major changes to the list with its substantial reduction. The main argument for this reduction was the approximation of the domestic foreign list, because, according to the developers, our specialties are very narrow specialized and not very well understood in the global labor market. Without being a specialist in humanitarian or technical science, we cannot comment on the adequacy of that argument according to the specified science. But about economic specialties, there are certain doubts about the sufficient grounds for such action. From our own experience we know that some specialties, which were seized because the fact that abroad there were not ones, in fact, they were and also in the famous universities. However, we leave this to the discretion of the general educational community and back to the question of exchange activity. In the new regulation there was not such knowledge field as “Specific categories”, and therefore the specialty “Exchange activities”, which having existed for about 5 years, got laid off. However, specialty 076 “Entrepreneurship, trade and exchange activities” appears in the newfound area of expertise 07 “Management and Administration”. It must be said that the term “exchange activity” appeared just a few months before the adoption of the resolution. Until then, for a year and a half of discussion of the draft resolution on the exchange's activities was not mentioned anywhere. Because of the list of specialties has been removed has long been known and traditional specialty, we believe that the inclusion of exchange activity may indicate a fairly powerful lobby, supporters of active development of domestic stock market, which from our side is most welcome. However, despite the fact that the Resolution No. 266, it was a period of introduction the 1.09.2015, at the time of writing this article, the understanding of substantive content of a new specialty in the educational institutions is still missing. Thus, speaking about the legal framework of training of specialists of the stock market in Ukraine we can see that it was not cloudless. The steps were done, did not create a unified system of training and demonstrated rather the inability to ‘shy away’ from the problem than the desire to seriously tackle. The above information concerned things of a formal nature at the national level, and with respect to the real state of Affairs in educational institutions, it is the following. Since the understanding of the importance of exchange activities, the leaders and teachers who are looking to the future, there is, in many educational institutions in various specialties of an economic nature are disciplines directly or indirectly associated with stock market activity. 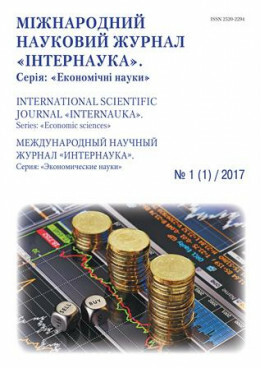 Moreover, interesting is the fact that based on the analysis of the names of disciplines for most of the leading educational institutions of Ukraine, it can be argued that the greater economic specialization of educational institutions is not a sign of greater awareness of the stock market. There are some classic economic universities, where exchange activity is not so much attention, while there is a sectoral educational institution, economic departments which have several relevant disciplines and provide theoretical knowledge and practical skills in the stock market at a fairly good level. In this case, we should also stop at the National University of Life and Environmental Sciences of Ukraine. There is at the faculty of Economics, almost 15 years successfully operating the Department of exchange activities, which during this period was and remains the only Department in Ukraine. The first 5 years of its existence, the Department of exchange activities supported, giving the basics of exchange activities to students of different faculties. However, already in 2006 by the Order of Ministry of Agrarian Policy of Ukraine № 292 dated 13.06.2006 g. at the Department of exchange activity was opened the specialty “Exchange activities in the agricultural market” for students of specialty “Economics of enterprise”. And given the importance of stock market development at the same time for master’s degree students of specialty “Finance and credit” was introduced master's program “Exchange activity in the stock market”. Since that time the Department acquired the status of graduates, annually produced on the domestic market from 15 to 30 qualified economists and financiers, professional level of which is determined by the speed of their employment in organizations and institutions that are participants of the stock market. A significant event for the Department was the opening in 2006 on the basis of Educational-scientific-production laboratory exchange activities, which is equipped with modern appliances. The software laboratory that is used during training allows real time to run on existing electronic platforms as the major domestic stock exchanges and major exchanges of the world . Also, the Department along with the Odessa agrarian exchange was developed and commissioned a computer program ‘Electronic agricultural exchange’. After the introduction of Resolution № 787 of the specialty “Exchange activities” were only two educational institutions took over its licensing – the already mentioned The National University of Life and Environmental Sciences and The Sumy State University. Both universities obtained licenses in 2014, but the first sets were launched only during the entrance campaign 2015. At the same time, in connection with absence of the Scientific-methodical Commission of the Ministry of Education and Science of Ukraine the branch of “Specific categories”, a session on exchange activities, and industry standards, and curricula, and therefore the curriculum and SSU have developed independently, based on their vision for the development of the specialty. For example, at NULES, it was decided on the base of the specialty ‘Exchange activities’ to introduce three master programs, each of which will provide a more narrow specialization. In particular, the master program ‘Management risks in the stock market’ aimed at training of specialists through effective use of stock market tools and can minimize both operational and financial risks of almost all spheres of economic activity. The graduates of the program “Analysis of Financial and Commodity Markets” will have a profession which afford them to develop and implement forecasts of domestic and world markets, both in general and within specific commodity groups or financial instruments. To the scope of the study program “Professional Activity in Securities Market” includes such activities as securities trading, depositarial activity, evaluation activity, managing assets of individuals and legal entities. In addition to specialization, graduates of all master's programs of the specialty “Exchange activities” will be able to trade in the commodity and stock markets, as from the standpoint of the interests of enterprises and organizations, as well as for itself. The logical evaluation of the work of the Department was that it was recognized it as fundamental in methodological support of disciplines for exchange activities by the Ministry of Agrarian Policy of Ukraine. Thus, in terms of training for the exchange market was made the next positive steps. And given the fact that, as already noted, according to the Decree No. 266 the specialty “Exchange activities” will be transformed into a “Business, Trade and Exchange activities”, we assume that, in connection with the expansion of its use, the number of educational institutions who will be engaged in this specialty will increase significantly. However, there is a risk that most of them will not focus specifically on exchange activities, building curriculum based on traditional disciplines. In this case it may be useful to experience in stock market training abroad. So, in the US stock market are allowed to work only by trained personnel. Therefore, almost all public universities have certified master program for training of specialists for the stock market. Regarding the baccalaureate, and there is a large number of relevant undergraduate programs, which may have different names, but remain focused on the stock market, “Investment activity in Stock Market”, “Stock Trading on the International Financial Markets”, “Business Analyst Operations at Exchange Financial Markets” etc. In European universities a number of programs exclusively stock characters are less because the specialists training for the stock market usually lies with the exchanges. However, despite this, the number of disciplines that relate to exchange activities in the curriculum of economic specialties is still very significant. For completeness in the study importance terms of exchange activities in schools, consider that quite an interesting and instructive may be the following fact. The draft Law About the Kyiv Agricultural Academy, developed by the government of Ukrainian National Republic in 1918, one of what is now called normative disciplines, which needed to be studied at the faculty of Economics was ‘Credit, Exchange and Bank’ [5, p.5]. Due to objective reasons the Kyiv Agricultural Academy was not organized, but this fragment of history vividly shows the importance attached to the study of exchange problems. By the way, in our time, in independent Ukraine, none of the economic occupations exchange disciplines became regulatory. However, training for any field is only a part of its staffing. Not less important component is a retraining and refresher training. Unfortunately in Ukraine by the state in this case was made even smaller than in the training plan. However, since the educational services were subject to less state regulation than training, it was some success has been achieved through the actions of the participants of the exchange market. So, if we talk about stock market, one of the main participants of the system of training and retraining of specialists was the Ukrainian Stock Market Development Institute (USMDI) by Kyiv National Economic University. This Institute was established as a centre for training and retraining of the stock market. It also acts as a Training Centre of the National Commission on Securities and Stock Market. Education, training and professional development is carried out in following directions: training of specialists of higher educational and qualification level ‘master’, training on the stock market, seminars on topical issues of financial services markets of Ukraine. In addition to the Ukrainian Stock Market Development Institute such actions are also a number of institutions that have received appropriate permissions from the National Commission on Securities and Stock Market and teachers who were certified in USMDI. As for a commodity exchange market, there should first of all talk about its agricultural segment. In particular, in 2007 between the Department of exchange activity, National University of Life and Environmental Sciences of Ukraine and the Agrarian Stock Exchange was signed a cooperation agreement for the provision of training and retraining of specialists of the stock market and opened a Training-practical courses brokers on the basis of Educational-scientific-production laboratory exchange activities. The trainees after their graduation received a certificate of the state sample on improvement of professional skills of brokers and the certificate of the established sample which provides the right to carry out practical activities on the organized exchange agrarian market of the country. Relative to other segments of the stock market, then they have the issues of retraining and advanced training began to decide the participants of the stock market, both individually and within the framework of public associations (associations). Moreover, these programs can be very varied as to timing and content. For example, the commodity exchange ‘Ukrainian energy exchange’, which is the authorized coal exchange has its own training center, which offers free training, which will take about two hours. And training centre of the Investment group ‘ART CAPITAL’, which provides the most complete range of financial products, has a range of training programs from free 45 minute to quite expensive, designed for 20 days. We must say that this practice is traditional and for stock markets in developed countries. All major exchanges have their own training centers, where training and retraining of those wishing to work on a particular stock market. As for the European educational space, as we have already noted above, this is the main direction of the exchange market of highly qualified specialists. Another way of identifying potential participants for work in the stock market is a different kind of event organized by professional participants of stock market seminars (webinars), round tables, presentations, contests. Virtually all serious participants of domestic stock market are the organizers of such events, because their success in the professional field is the result of their vision for the development of exchange areas in the future, where educational projects are one of the key places. For example, we want to look to the “Ukrainian Stock Exchange” activities. It is the organizer or co-organizer of several projects. In particular, was launched in 2012 “Competition for young investors”. It was a contest for the stock trading that takes place between pupils of Ukrainian schools during the school year taught the pilot course “Financial literacy”. The competition “Best private investor” is the first Ukrainian stock exchange competition among private investors. A feature of the competition is the ability to quickly observe the results and implemented trading strategies of all participants. For those who are just learning this contest is a good opportunity to try their hand and learn from the positive experience of the leaders of the competition. “Exchange Universiade” is the championship of Internet trading among students of higher educational institutions of Ukraine. The aim of the project is to provide students with the opportunity to test and fix on the real exchange trading knowledge acquired in the University training program. The championship is attended by about seven dozen local schools that show interest of students in such events and exchange activities in General. By the way, despite a high level of self many participants of the championship, a serious methodological attitude to training within the context of University education still has an impact, because the command of the Department of Exchange Activity, National University of Life and Environmental Sciences of Ukraine was the only one that for the entire period of the Universiade were the best annually. The highest levels of training from the standpoint of classical education should be considered writing the thesis and getting my degree. However such is the level of training is more appropriate not so much to experts of the stock market, how many people that they will be prepared. In this case one can talk about a scientific specialty areas of Economics: world economy and international economic relations; economy and management of national economy; economy and management of enterprises; money, Finance and credit. All of them are preparing their dissertations on issues of the stock market. However, there is a certain lack of resolution. The stock markets in passports specialties, which are designed to regulate areas of research, are represented quite well. So, specialty 08.00.02 – world economy and international economic relations in his passport has item 11 – “International Investment Portfolio and International Stock Market”. Specialty 08.00.08 – Money, Finance and Credit, several points: 16 – “Financial Market and its Segmentation, the tools and infrastructure of the securities market; portfolio investment; the state in financial markets”; 17 – “stock market, stock exchange and stock exchange transactions”; 18 – “hedging financial risks; market of derivative financial instruments”. As for the exchange commodity market, it is about him not talking at all. Therefore, the study of this problem, usually conducted from the perspective of the study of exchanges as businesses (specialty 08.00.04 - Economy and management of enterprises), or from the standpoint of the value of the exchanges in the national economy (specialty 08.00.03 - Economics and management of national economy), which does not quite meet the desired format of the research. We have no doubt the scientific study of problems of the stock market allows the author of the thesis to become a highly qualified specialist in this field. However, firstly, such a method of training could not be viewed from the point of view of its mass use. Secondly, in domestic science and education traditionally, there is a negative tendency, when the author, having spent years studying one or another subject of study, after graduation, he moves on to other problems, thoughtlessly losing the knowledge and experience. This fully applies to the stock theme. Over the last ten years was protected by more than two dozen dissertations on the topic of the stock market, as stock and commodity. In this case, the names of the researchers, unfortunately, in the future do not become famous nor powerful scientific events, nor among the practitioners of the stock market. Such a situation gives grounds to state the unsatisfactory and at this level, the staffing exchange market. Thus, summing up the work, we want to focus on a few main points. The importance of the stock markets in the world no doubt and declarative we can observe in Ukraine. A high level of importance naturally raises the appropriate standards and level of professionalism. However, as shown by the analysis, in Ukraine, it is currently not formed a complete system of training specialists for work in the stock market, which determines the efficiency of its functioning. The state steps are situational and often a consequence more of a tactical lobbying than deliberate strategic public policy. This level of training, in turn, poses increased challenges to the retraining, which usually involved the participants of the exchange market. Therefore, the General conclusion on the formation and staffing of the stock market in Ukraine, in our opinion, will be negative. In the article we showed that in this direction something is definitely being done, but on the general state of affairs is almost no effect. Regarding the proposals to improve the situation, they will be as follows. In the preparation of the sectoral higher education standard for the newly created specialty "Entrepreneurship, trade and exchange activities" with educational qualification characteristics of specialist to include competence in the field of exchange activity. This will "legitimize" the curricula disciplines on exchange activities, which were highly selective and could be added or withdrawn at the sole discretion of a-level leaders in schools. Not to abandon educational and professional programs, as declared by the Ministry of education and science of Ukraine, since it is a fairly effective mechanism of maintenance of the state educational policy. On the basis of the 1.5-year masters training in Ukraine, to highlight the third semester fully on production practices, aligning it with loans for the preparation of the final work. Self-regulatory organizations claiming to represent certain segments of the stock market should be aware of their social responsibility for the situation in the domestic exchange market of the country and to intensify its activities towards the collaboration with the educational establishments which prepare specialists of economic profile. The same applies to the educational institutions themselves, which are often too closed to outside influences on their training program. In general, when developing any normative legal acts aimed at development of the stock market, it is mandatory to include items relating to training and retraining of specialists of the stock market. Hordiyenko V.P. Osoblyvosti formuvannya profesiynoho movlennya u spetsialistiv birzhovoyi diyal'nosti / V.P. Hordiyenko // Novi tekhnolohiyi navchannya. Vyp. 50. - K.: In-t innovats. tekhnolohiy i zmistu osvity, 2007. - S. 16-20. Hordiyenko V.P. Pedahohichni umovy formuvannya profesiynoho movlennya maybutnikh brokeriv ta dyleriv / V.P. Hordiyenko // Novi tekhnolohiyi navchannya. Vyp. 52. - K.: In-t innovats. tekhnolohiy i zmistu osvity, 2008. - S. 59-63. Lenchuk O.I. Formuvannya i rozvytok investytsiynykh fondiv na birzhovomu rynku / O.I.Lenchuk, I.V.Okhrimenko // Perspektyvy sotsial'no-ekonomichnoho rozvytku ahrarnoho sektoru Ukrayiny [red. S.M.Kvasha ta in. / chastyna 2]. – K.: PP Lysenko M.M., 2014. – 292 s. – S. 262-263. Metodychni vkazivky do prokhodzhennya navchal'noyi i vyrobnychoyi praktyky z birzhovoyi diyal'nosti dlya studentiv spetsial'nosti 8.18010009 «Birzhova diyal'nist'» / [M.O.Solodkyy, I.V.Okhrimenko, V.O.Yavors'ka, T.Yu.Androsovych]. – K.: TsP «Komprynt». – 2014. – 34 s.
Nevidomi ta zabuti fakty / [red. D.Mel'nychuk, O.Mel'nyk] // Za sil's'kohospodars'ki kadry. - # 11 (1857), 6.10.2005. – S.5. Osvitn'o-kvalifikatsiyni kharakterystyky molodshoho spetsialista napryamu pidhotovky 0501 - «Ekonomika i pidpryyemnytstvo» / [kol. avt. za zah. kerivn. A.F. Pavlenka]. - K.: KNEU, 2004. - 100 s.
Okhrimenko I.V. Rehulyuvannya birzhovoho rynku: navchal'nyy posibnyk / Okhrimenko I.V., Stasinevych S.A., Krayevs'kyy V.M. – K.: TsP „Komprynt”, 2016. – 144 s.
Rynok tsinnykh paperiv Ukrayiny: rozbudova infrastruktury / [Okhrimenko I.V., Stasinevych S.A., Yavors'ka V.O. ta in.]. – K.: TOV «TsP «Komprynt», 2014. – 254 s.